Did the Earth Move for You Too? Transformation. It was a lazy afternoon on October 13, 2011. A cup of tea had just been poured, as we sat on the porch of our guesthouse in Ubud, Bali. The teenager was fast asleep inside. 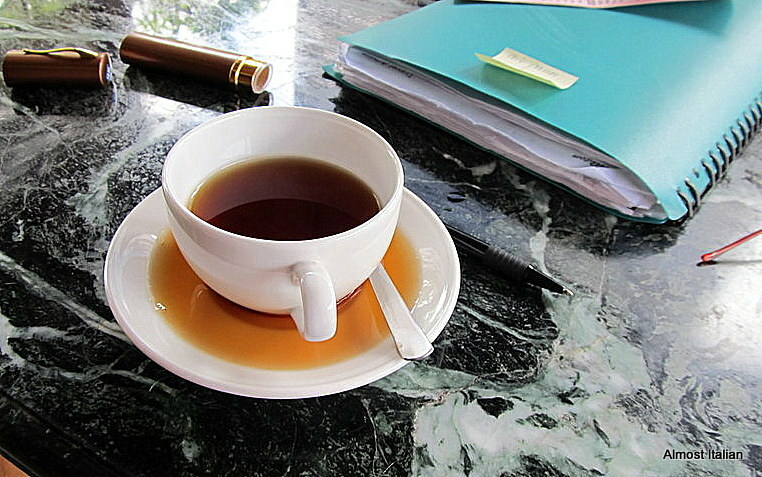 Our teacups gave us the first hint that this moment in time would be transformed by an earthquake. We were bemused by the behaviour of our tea as it began to convulse onto the saucer. Then we noticed a few other odd things; the walls seemed to be moving and small chunks of concrete debris fell from the ornate Balinese walls. Time stood still as seconds stretched into minutes. Wake up Mischa, we have to get out, now! The teenager would not budge, adding an extra dimension to our adrenalin. As we bolted down the outside stairs, the concrete steps swayed in time to the movement of the gusting palm trees and the metal hand rails shuddered. At 6.2, it was a big one by Balinese standards and was followed by a few aftershocks. The locals were really afraid, although had been trained from childhood to evacuate buildings quickly. In true Balinese style, they were genuinely concerned for their foreign guests. Fortunately, no one was seriously injured. Thanks Ailsa for the travel prompt this week. I’m assuming you got your teenager out of the house. I’ve never experienced an earthquake here in Toronto even though some areas of the city have experienced some very slight tremors over the years. We got her out, though with great difficulty. We had to shake her harder than the actual earthquake. I stayed awake for three nights after that, so I could be on quake duty! Gosh, that is a shock (pardon the pun). We were awakened early one morning in Las Vegas, on a very high level of a hotel, from effects of an earthquake happening in Los Angeles. So scary. The after shocks are quite unnerving. I must say, you always put a unique spin on Ailsa’s themes, very interesting interpretation Francesca, and bravo to you for having presence of mind enough to take a photo of the tea cup! Thanks Ardys. It is my worst nightmare, to be buried alive in an earthquake. I can imagine how scary that would be!! It’s frightening to be in an earthquake. I have been in a few when I lived in Japan! I was in Rome in late September 1997 when an earthquake struck central Italy. In the wee hours of the morning, with everyone asleep in the hotel, it was quite a shock to see everyone running out into the hallways in their pyjamas wondering what was happening. It felt like it was next door. Scary stuff. It is very scary when it happens and the rush of adrenalin is never forgotten. We get a few tremors here on Gippsland and they are always unsettling. I dare not think what a biggie would be like. Nice looking tea! That one a few years ago in Gippsland was a biggy- we felt it in St Andrews and ran outside. Yes, even at 5 they can be scary. Some big ones have occurred over the years in Italy, especially that one in Abruzzo in 2009? and then earlier in Assissi. My worst nightmare. Thanks Sue- it was a funny little pic to remind us of the event. Very frightening….I’m glad that I can’t imagine it. Scary! Glad no-one was injured. It was terrifying. A lot of tourists left. For a minute, I thought what a lovely inviting restful photo, then my brain registered what was not quite right! I was in the Hunter Valley north of Newcastle during its earthquake. No-one was quite sure what happened. Not our usual cup of tea either! No, not a calm little cuppa indeed. Time just stands still when they occur. Nasty events. Scary. Great entry. There were some shaky seconds of that in Christchurch when we visited after the big one. you feel small against the forces of nature. Thanks Leah, they are rather terrifying when they happen. i though you may have felt a few over there Miss Kiwi. Lucky you haven’t. Hey Miss .. I know. But I haven’t .. Good! Previous Previous post: Symmetry in Rome. Piazza del Popolo. Next Next post: Zuppa Estiva di Cozze. Summery Mussel Soup.